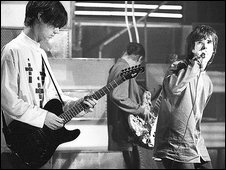 As a parade of recharged rock bands try to recapture past glories, former Stone Roses guitarist John Squire has not only refused a reunion, he has turned his back on music completely. Twenty years ago, he helped make one of Britain's greatest albums, the Stone Roses' debut. But now, Squire, whose Jackson Pollock-styled album sleeves were as memorable as his signature guitar lines, has devoted himself to visual art. He has just opened his largest solo exhibition to date, his first in a public gallery. For Squire, art really is the new rock 'n' roll. Early artistic talent saw him start out working for children's TV animators Cosgrove Hall, making props for Wind in the Willows and Cockleshell Bay. He then produced band artwork, before moving on to his current abstract, self-contained works. The tipping point between music and art came in 2004, after his last solo album Marshall's House, based entirely on paintings by American realist Edward Hopper. "That wasn't intended as a finale," he says. "But in retrospect I think that might have been a turning point. "I didn't decide to stop doing one thing and start doing another, it just seemed to happen organically. Initially painting became more important, more interesting, more challenging, and gradually took over." Around the same time, he converted a barn at his home near Macclesfield to an art studio and staged his first exhibition at the Institute of Contemporary Arts in London. Art allows him to work faster and without other people, he says. But the most important thing is the richer relationship with the audience. "I don't have a great amount of musical knowledge and technical ability, but I find that the structure of the business cycle of popular music quite narrow and limiting," Squire says. "Whereas in this world, you can do anything you want. And it's more open to interpretation than a pop song. It can mean more things - maybe to a smaller audience, but I think ambiguity is the key. "The relationship that somebody might have with one of these pieces is likely to be more varied than a relationship they'd have with a song I've written." The exhibition, at Gallery Oldham, has seen Squire fill two large rooms. 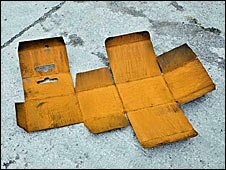 One contains half a dozen large free-standing rusty steel boxes that have been picked apart and opened up. They are large-scale versions of cardboard boxes found in shops, reflecting a concern about modern packaging. The largest, 8ft tall, is based on a tiny box that once contained a small tube of paint. "Now it resembles a shower booth or a telephone box," Squire explains. To make them, Squire taught himself to weld, which turned out to be an arduous process. "It's filthy, noisy and dangerous," he says. "I burnt my arms and my scalp on a daily basis, I set fire to my hair, the studio [and had] two visits to A&E to have shards of metal removed from my eye. "I couldn't wait to get back to painting to be honest. But I think the results justify that torture." The second room houses wall-hung pieces along the same theme, made from a variety of materials, including sheet lead, beeswax, rust, salt and old-fashioned oil on canvas. Many incorporate the box shape, while others just use the outline of the narrow hole typically found at the top of small boxes to hang them from rails on shop walls. It turns out that these holes are called Euroslots and they have become the motif of the exhibition. A couple of large pieces just feature silhouettes of hundreds of Euroslots, scorched into the canvas with a blowtorch. When rumours of a Stone Roses reunion reached fever pitch earlier this year, Squire turned to his art to send a message to the world. 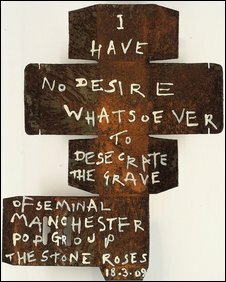 On a photo of one of his rusty boxes, he superimposed a message: "I have no desire whatsoever to desecrate the grave of seminal Manchester pop group The Stone Roses." "I was becoming more frustrated as the rumour grew," Squire explains. "I kept getting calls - is it true, is it not? The wife was getting calls and my cousin's kids were asking me for tickets. "It needed laying to rest and that seemed like quite a novel way of doing it. It seemed to do the trick." The question of whether he sees himself returning to music in the foreseeable future is met with a simple answer: "No." He even has an unfinished, unreleased third solo album gathering dust. "I was playing some of the best guitar I've heard myself play," he offers. "But just the thought of packaging it for public consumption, touring it, putting a band together, didn't appeal to me." There is one similarity between music and art for Squire. He loses interest in all of his creations once they are completed. "I don't listen to any music I've made," he says. "I don't listen to the Roses or [later band] The Seahorses or the solo stuff. "If it comes on the radio, I turn it off. If one of my kids wants to watch me on telly on one of the satellite music channels, I leave the room. "I'm not interested in what I used to do. Just what's on the easel, what's on the workbench at the moment. I find revisiting work quite tedious actually, and stagnant." Does he never go back and appreciate what he has achieved, even if not to wallow in it? "Probably, yeah, if I had a reason," he replies. "But there are only so many hours in the day. "What's the point in dwelling on things you've signed off? You can't affect them any more. They are dead. "So why not move on and put your energy into something that's current and alive?" 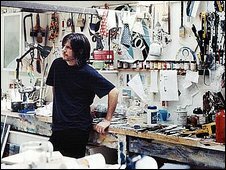 John Squire: Heat, Light, Death and Industry is at Gallery Oldham until 9 September.